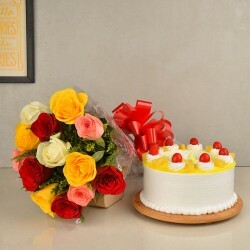 Send Valentine's Day Flowers and Cakes Combo to your special people to make the emotions blossom in your relationship on this day of commemoration of love. Flowers make the best gifts for the beauty and fragrance they bear is incomparable. 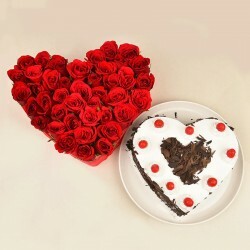 Make your Valentine's day acquire a new meaning by adding the sweetness of cakes to it. Valentine’s Day is the recognition of love shared between two souls. It is a day that marks the role and value of our special ones in our lives. Love is a feeling that celebrates itself everyday in little acts of care and affection. However, Valentine’s Day ensures there’s no stone left unturned in understanding the magnificence of love. Therefore, the celebration of this magnificent feeling needs to be magnificent too. Wonder how you could do that? Go classic this season with Valentine’s Day flowers and cakes. Gifts like flowers and cakes never go out of style. So, make sure you go for the classic best and add a page to your fairytale love with your romantic gift idea. 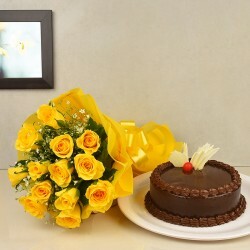 Go for your special one’s preferred Valentine flower and cake combo to make the day memorable. 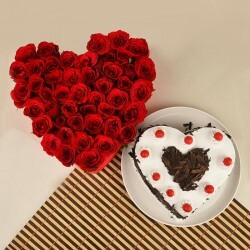 MyFlowerTree has a vast assortment of Valentine Day flowers and cakes to choose from. We have creatively crafted bouquets of fresh flowers like roses, orchids, carnations, gerberas etc. 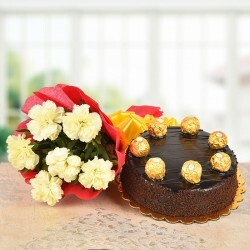 You may go for your significant other’s favorite type of flower and combine them with our scrumptious range of Valentine cake flavours namely black forest, chocolate, pineapple, coffee, fruit cake and so forth. Some of our popular hampers like Floral Medley Hamper, Evergreen Classic Hamper, Serene Beauty and so many more have won several hearts and it is time you trust these best selling Valentine day flowers and cakes combo online to win the heart of your special one’s too. If your love for your significant other is immense but distance creates a bridge in expressing the same, we are here to help. 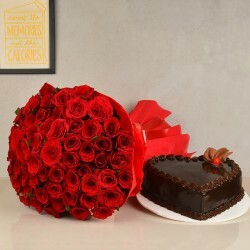 Choose Valentine day gift delivery from MyFlowerTree and deliver your love in no time. 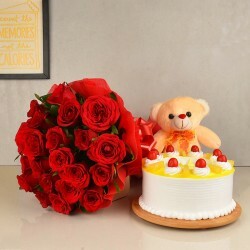 Send scintillating Valentine flowers and customised Valentine cakes from MyFlowerTree and we will ensure that we make the fast delivery of your gift to your loved ones. We extend our services to offer same day delivery of Valentine gifts if you have made last minute preparations to send Valentine gifts to your special one. 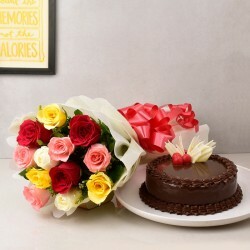 However, if you plan to surprise them at the stroke of midnight, save yourself from the hassle of making all arrangements on your own as we shall deliver your chosen Valentine flower and cake combo anywhere in India. So don’t let the distance kill the love between you two. Order unique and customised gifts for Valentine’s this season and ignite the romance like never before.